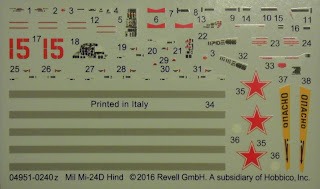 A closer look at the 1:100 MIL Mi-24D Hind model kit by Revell. Looking at the informations from Scalemates, it seems that this kit was published by Revell for the first time in 1993, this kit is the 2016 version with a full color instruction manual. 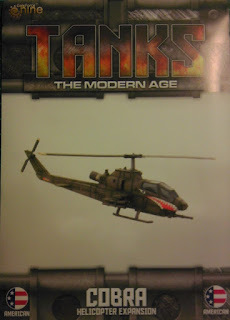 It was one of the first helicopter kits I bought, and when "TANKS The Modern Age" was published, it seemed pretty clear what I would do with it. Included in this kit are 4 sprues full of parts, including one sprue with clear parts, and a nice decalsheet with a lot of decals for just one version. The kit looks good at the first look, no flash or visible ejectormarks. But there are some minor sinkholes which I found when I basecoated the model. Also, when built, there are some small gaps which could need some filling with putty. But except for that, the overall impression of this model kit is good and building this kit went on without any big issues, more on that later. 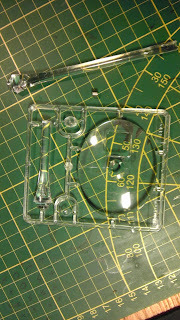 The clear parts for the cockpit canopy and the side windows are relatively thick and distort the view slightly. Since I built this as a gamepiece, I painted the clearparts black from the inside and masked them before I painted the kit. This way they will keep their shiny look. 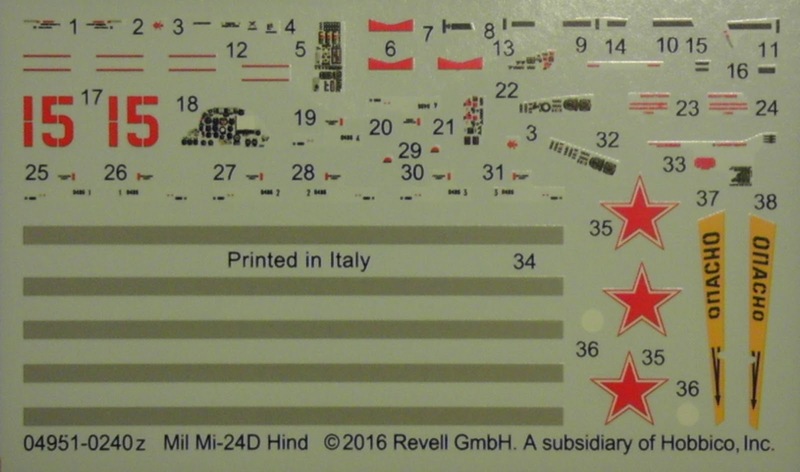 The pretty extensive decalsheet is produced in the usual good Revell quality and offers one version, from this kit you can build a Mi-24D of the 335th Aviation Regiment stationed in Kundus/Afganistan in 1980. When I built this kit, I had some smaller issues building the main rotor, the way it is shown in the instuctions is not the easiest way to build it, but beside that the kit is nice. 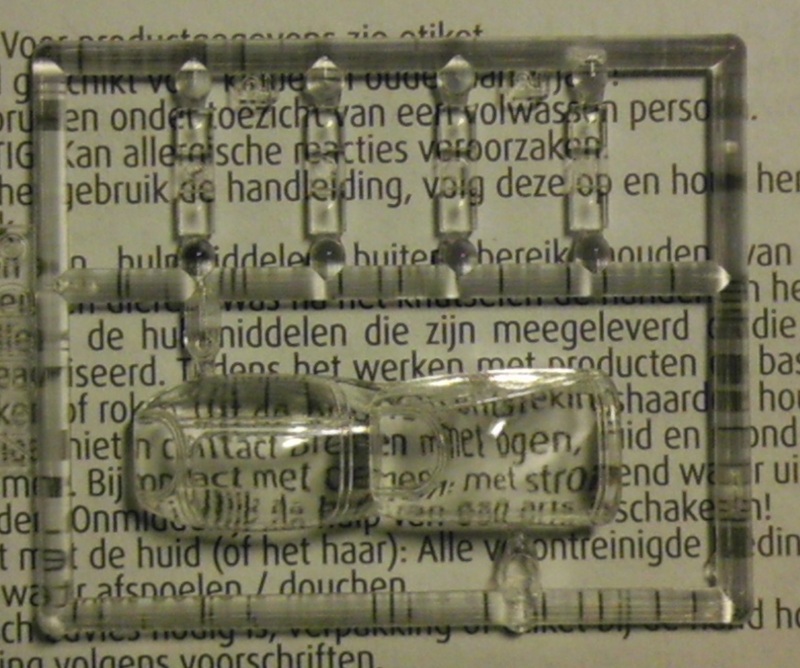 Also, a little bit annoying is the plastic which is used for this kit. Smaller parts get pretty soft when glue is attached and need some time for drying. With its minor faults, this is a nice model kit, especially for its price. I got three of them and paid an average price of 5 Euro. Two are already built, the third will be kept for later. Both are used for "TANKS The Modern Age", and they are accompanied by the Battlefront Miniatures (Team Yankee) kit from the game expansion. 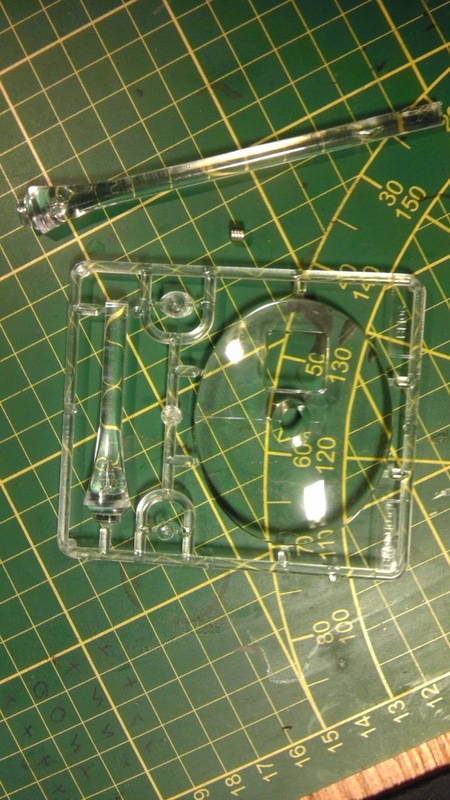 As you can see, I made new base pieces for the clear rods of the flightbases, the reasons are that there are 2 clear rods but only one base piece included (what a waste), and the the included base pieces were a little uneven. The new bases are very simple, a plastic disc with some grass mat attached, but they blend in nice on our battlefield. Their first deployment will be "OP Easter Front" next weekend, when we will have another 4 player game. 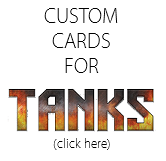 This is a list of cards which can be used for both "TANKS" games of GF9. While a lot of the crew cards got lower point costs in "TANKS The Modern Age", the cards listed below have in both games the same costs and effects. This list may be incomplete, if I will find more (on both games usable) cards, they will be added. The reviews from this blog and the official website of the games were pretty helpful to make this list. The picture in this post shows one of my mate Ollis Leopard 2 tanks, in "TANKS The Modern Age" these beast costs 32 points per unit. We will see if they are worth their price. Maybe I should work on a Hind only list to beat them with pure air advantage. In the closer look at the Hind expansion for the game you will see, that these things are very strong. 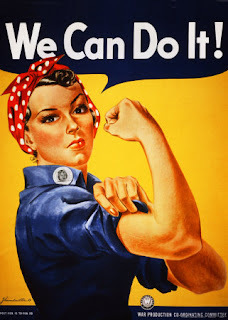 This will be my last posting for March. I need some time after some very sad news. The death of a friend is always a devastating loss and I need some time to overcome this. The closer looks at the Revell 1:100 Hind and at the "TANKS The Modern Age" Hind will have to wait some more time. This is for you friend, whereever you are. A closer look at the Cobra helicopter expansion for "TANKS The Modern Age" by Galeforce 9. The game is a follow-up to "TANKS" with an extended ruleset. While in the old "TANKS" you have only control over ground units, in "TANKS The Modern Age" you can also use air units for you platoon. As usual, in this expansion one 1:100 model kit, taken from the "Team Yankee" tabletop game and some cards for the game are included, a flyerbase for the helicopter is also included. First we take a look at the plastic, this kit comes in 3 different sprues. 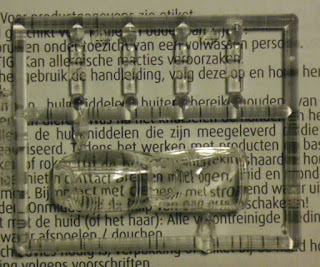 The kit is almost flawless, there is minimal flash to remove, neither sinkholes nor visible ejectormarks were found on the sprues. Also there are virtually no mouldlines. As other kits from this range, the qualitiy is top. Different weapon configurations can be attached, the instructions, as usual simple but well made, show only one version, for other weapon configurations you have to search the web. At the end of this video the leftover bits are shown and partly explained. The flightbase is casted in good quality, gives you two height options and offers the choice for magnetization, but it works fine in my Cobra/Hind helis without magnets. 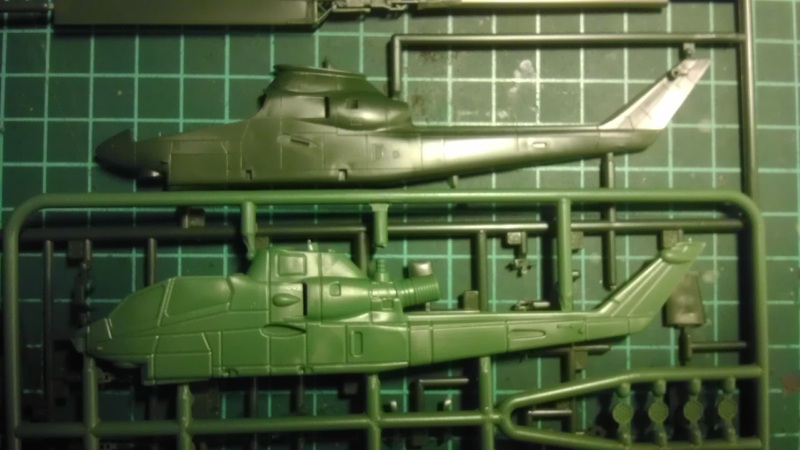 The last picture of the plastic shows a comparison between this Cobra kit and the 1:100 Revell Cobra kit, can you see, how oversized the panel lines are? I am no aviation expert but it seems like that the kits show different versions of the Cobra. Beside the model kit some crew and equipment cards for "TANKS The Modern Age" are included in this expansion. First there is the card for the unit itself, the Bell AH-1 Cobra offers an Initiative of 7, what is pretty good, its Attack of 2 is very low but you may equip the missiles included in this expansion. The armour of 3 is pretty high but the helicopter has only 4 hitpoints. Its rapid fire ability offers 5 dice versus unarmoured vehicles and other helicopters. For the cost of 26 points (both missiles included) you get a unit which can attack everaything on the battlefield. The included equipment offers the additional armament for the Cobra, the "M159" gives you a 3 dice attack against all vehicles in close range, the targets can only roll their base defence. The "TOW" missiles give you a 4 dice missile attack for 2 points. The other two equipment cards are "Defensive Manouevres", which gives you a reroll of your defence dice when you discard it, and "Countermeasures", for 3 points you may discard this card, this defence throw 3 also counts for defence. After the equipment cards, there are only the crewcards left. First the 2 US heroes included, "Harry Stevens" gives you for 8 points an additional armourpoint and you may change elevation without taking a speed token. This is perfect for the heavy use of missiles. "Connor Styles" gives you an additional dice if you use rockets and you have the possibility to reroll a sucessless attack. For 6 points this gunner is a very useful addition to any US helicopter crew. Then there is the "Defensive Pilot" which lets you reroll one defense dice for the cost of 4 points. Last but not least there are 3 different gunners included, the "Risky", the "Ressourceful" and the "Bloodthirsty Gunner", all 3 can be used by all nations for all vehicles. The "Risky Gunner" would work fine with the M159 missiles. Again this is a nice addition to the game, the modelkit is fine (except for the oversized panel lines), and the cards will offer additional choices to equip your troops. 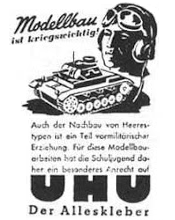 The cobra must prove its worth, but I think it may stop the enemies Leopard 2 tanks when the Americans will try to conquer Germany after the Soviets are defeated. Next in line are some more closer looks at some helicopter kits, pictures of the Hind expansion and the Revell Hind are already uploaded, both will come this weekend, and then we will return to Sassnitz, showing the miniatures I prepared for last years first game of "Rügen'46". The kit was finished faster than this post. Take a look at the finished kit (and my chaotic hobby desk) at the picture below, only the heckrotor has to be attached, but it will get painted seperately and then it will get glued on the tail of the Cobra. Some pictures of the 1:100 helicopters I (almost) finished for use in "TANKS The Modern Age". Since I am not satisfied with the Battlefront models of these helis, a closer look at them will come soon, I am using 1:100 "true" model kits. 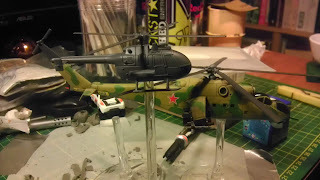 First I finished the Revell 1:100 Mi-24 Hind, a closer look at this kit will come in the near future. The building of the rotor was a small struggle but finally all parts fitted as desired. While I built this kit some smaller parts disappeared but I did not care about it since it may not get noticed and this heli is for gaming use only. Both helicopter models were painted with Revell Aquacolors, the most work was done using my airbrush. The camouflage pattern was created with liquid masking solution, using Sand and Fern Green. The bottom was sprayed Torquoise toned down with a minor amount of White. Before the model got an oilwash, it was sealed with a layer of clear gloss paint, this picture was made when I did it. Some decals went to the sparebook, after the rest of them were set, the whole model was sealed with matte varnish, then I removed the tape from the cockpit, which was masked the whole painting process. The cockpit panels were painted and sealed by hand, but I am not too happy with the results. The rotor was magnetized, I glued a screw in the body and a magnet on the rotor. This works fine and makes storing this model much easier. 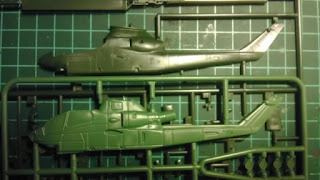 The other helicopter kit I finished for the game was the Revell 1:100 Cobra, which got a closer look in this post. This kit was built without any complications, then the canopy was painted black inside, glued in and masked, then the model got primed. For the basecolor I used Olivegreen, than the heli got a black wash with thinned oil paints. This darkened the basecoat too much, and I sprayed a very thin layer of Greenish Grey over the kit. Then came the usual procedure, glosscoat, decals, varnish. Too bad, the varnish got a little milky but it is not as worse as it seems on the pictures, at least the rotors will be repainted. The canopy was painted by hand after the maskingtape was removed but I will repaint it soon with a better matching color, this should be done to the Hind too. I still have to magnetize the rotor using superglue a screw and a magnet. At the moment it is only plugged in. I should have this earlier, the paintjob may get damaged because I have to widen the opening in the body. As final step both model got the flyer bases which were included in the heli expansion boxes for "TANKS The Modern Age", I drilled a 6mm hole in the bottoms of the helis, after some little sanding of the base insert, it was glued in. Both kits are ok, but I think I could have done better. Since I still have a Revell Cobra and 2 Revell Hind kits unbuild in my stash, I will try harder next time. But not only I am building my helicopter forces, my mate Olli finished a BO-105 PAH, see how tiny this thing is, comparded to the Soviet Hind gunship. I am taking some time to reorganise the postlabels of this blog, then one of the next posts may lead us into the ruins of the undead infested Sassnitz.